Everyone can take responsibility for conserving water at home. Whilst many of us can take a clean water supply for granted when we turn on the faucet, water that is safe to use in the home is one of the Earth’s most precious natural resources. 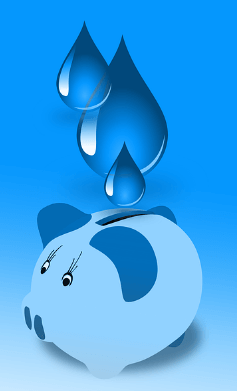 Here we look at some simple ways you can conserve water at home. Check all your water appliances for leaks. Check the toilet and the sinks in the home as even a small leak can cause extra water usage and more money added to the water bill. They can also cause damage you will need to repair. Every time you flush the toilet, you use about 5 gallons (20 litres) of water. Consider purchasing a dual-flush toilet. Do not use your toilet as a trash can to conserve water. Insulate your water pipes. This will help to heat the water faster and prevent the pipes from freezing in the winter. If you want cold water to drink, keep a jug of water in the fridge instead of running the tap until the water is at the temperature you want. When preparing meals from frozen, plan in advance. Defrosting food under a running faucet requires a lot of water. Should you have a water emergency, such as a burst pipe, you can lose enough water to fill a swimming pool very quickly. Make sure that everyone in the home knows how to shut of the water system in case of emergency. To reduce risks of a water emergency, cut off the water supply to any areas in the home that you are not using. Also, read your house water readings at regular interval when no water is being used as another way to check for hidden water leaks. Turn off the water when you are brushing your teeth or washing your hair. Turning the tap off when you’re not using the water means that up to 160 gallons (605 litres) of water can be conserved each month. When looking for a new dishwasher, bathtub, shower unit, washing machine and any other water appliance, search for water-efficient products that meet the needs of your household. Whilst these may be initially more expensive up-front, they will quickly pay for themselves. Unless you have a washing machine that allows half-loads, always wash full loads of laundry to conserve water. The same rule applies with a dishwasher, only use when it is full. Most people are amazed at how much water they use in a shower. Taking just a few minutes off your shower time can conserve a significant amount of water. Install water saving devices such as a low-flow shower heads and faucet aerators to reduce your water use. Rainwater harvesting from your home downpipes is very simple. This conserved water can be used in your garden and with household plants. This is well worth considering if you live in an area of hosepipe bans. Also, use a layer of mulch around your plants and they will require less water. Plant your garden in the spring when less water is required. Choose plants that do not need to drink more water than that provided by mother nature or by grey water from your house. If you need to water your lawn, do so as little as possible and only when needed. Make sure your water sprinkler is set to efficiently water the lawn and is not sending water into the gutters, paths or areas where no water is needed. Water your lawn at the cooler start or end of the day. Avoid watering at the hottest time of the day as this leads to water loss through evaporation. If you have a small lawn, try to water it by hand rather than using sprinklers. This way you have more control over the amount of water used. If you need to water your lawn a lot, consider a garden design that does not include a lawn. Also in the garden, check your hoses and pipes for leaks, cracks, and other damage, particularly if you have an irrigation system where water loss may not be easy to spot.